frog cottage designs: Soo excited!!! 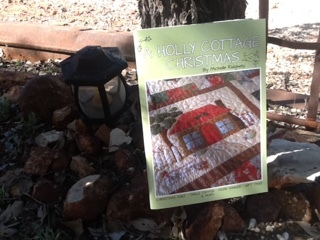 I was lucky enough to receive Michelle Ridgeway's first book, A Holly Cottage Christmas the other day!!! Michelle kept a big secret from us all!!! 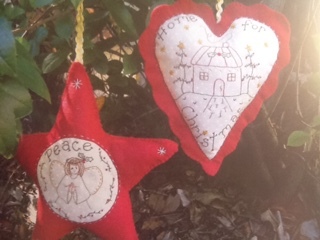 It's filled with lovely Christmas projects to make for love ones or swap partners. Michelle's inspiration for her first book was the celebration of the "heart" her family put into every Christmas they spend together; all in a Michelle's signature style. I've already made a list of items to make for my Chrissy swaps. 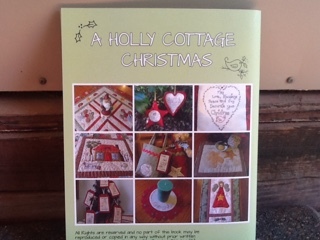 A cute candle mat using wool felt, and a few Christmas gift tags, and the Chrissy decorations, and the table topper, maybe all of the nine projects from the book.... Maybe Chookys stitchalong might make the Holly Christmas quilt for 2016. If you would like a copy of your own, head to Michelle's Blog. It's always great to see a fellow Aussie designer and friend, reach a creative goal! Congratulations Michelle on your wonderful book, I'm soo excited for you!! !